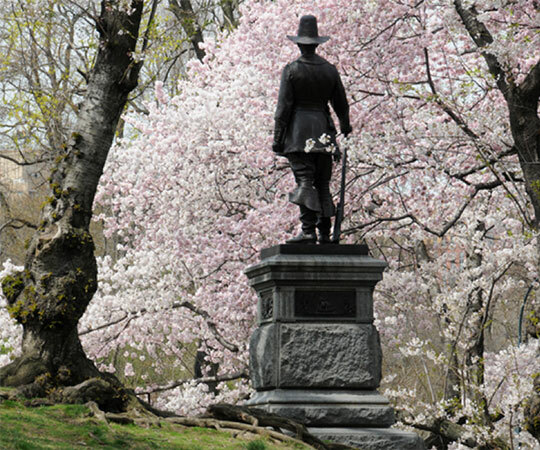 Each spring, Central Park’s flowers bring bursts of color to New York City. Looking for some of this season’s most photogenic landscapes? Here are your must-see destinations for beautiful spring blooms in the Park. Central Park’s formal six-acre garden is divided into three smaller gardens, each with a distinct style: the northern is a French-style garden; the center, an Italianate garden; and the southern is an English-style garden. 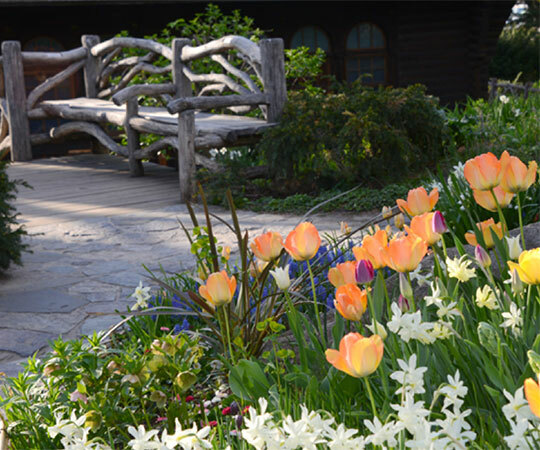 More than 45,000 bulbs were planted in the Garden last fall in preparation for spring, with blooms ongoing through May. A display — designed by the Garden’s director — of 20,000 tulips in shades of pink, purple, deep red, and pale yellow will appear in the North Garden alone. Expect this beautiful mix of tulips to peak in the last week of April. In the Center Garden, you’ll find two crabapple allées that typically bloom from mid-April to mid-May. In the South Garden, more than 40 cultivars of daffodils — some with distinct fragrances and others with multi-flowering forms or vibrant colors — will also bloom. The Woodland Slope (the Garden’s southern-most path) has many spring-blooming ephemeral plants that mingle with shrubs, trees, and perennials. Soft-yellow winter hazel and higan cherry trees are some visitor favorites. Want to see more? 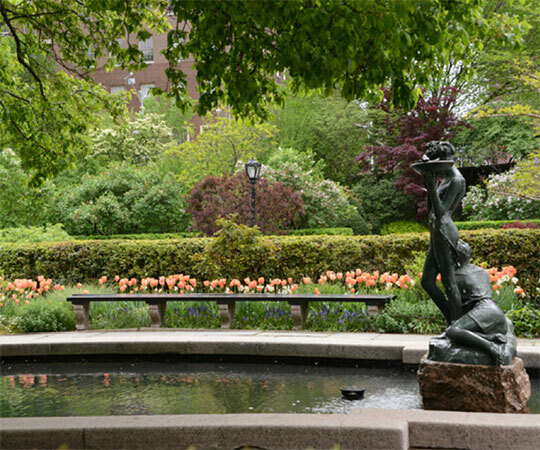 Take our Conservatory Garden Tour to admire these blooms and learn about the Garden’s history, design, and plants from the people who know it best. If cherry trees are your favorite spring bloom, don’t miss the landscapes surrounding the Reservoir. 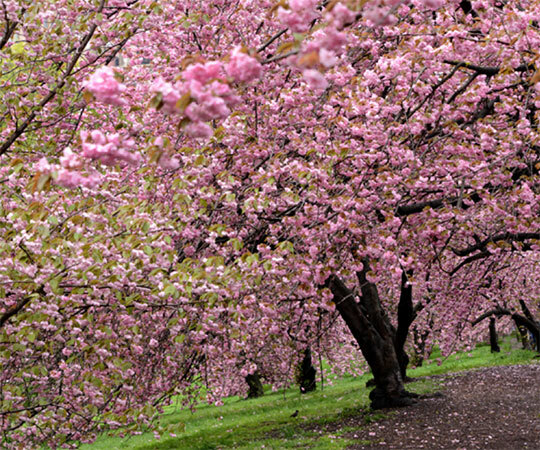 Japan gifted Central Park and Riverside Park with thousands of cherry trees in 1912. Nearly 200 Yoshino cherry trees were planted on the east side of the Reservoir, with a similar number of Kwanzan cherry trees planted on the Reservoir’s west side. Peak bloom time varies year to year and depends on the weather, but color typically appears between late March and late May. While you’re on the Reservoir’s east side, look for spring-blooming staghorn sumac, which features deep red fruit. On the west side, you’ll find the doublefile viburnum, which contains white flowers and is one of the Park’s most striking shrubs. Shakespeare Garden is a four-acre landscape named for the famed English poet and playwright William Shakespeare. The Garden has become a destination in spring for its ever-expanding collection of “minor bulbs.” They are mostly miniature, but are planted in large quantities so they provide sheets of early spring color. Throughout April and May, you can expect to see daffodils, tulips, roses, peonies, azaleas, violets, and many other flowers. Also look for 10 small plaques featuring quotes that reference plants named in Shakespeare’s writings. Want to learn more about Shakespeare Garden? See our recent blog post on the Garden’s unique attractions. A short walk from each other, Pilgrim Hill and Cherry Hill are two of the most stunning spots for Yoshino cherry trees in the Park. Pilgrim Hill gets its name from the bronze statue of a Pilgrim that stands at the top of its knoll. Cherry Hill overlooks the Lake with views to the Ramble, and gets its name from the beautiful cherry blossoms it sees each spring. This is the first spring to visit the newly opened Dene Slope, a vibrant native meadow just south of the Balto statue. In addition to a variety of grasses, you’ll find the black-eyed Susan, a deep yellow flower with a dominant black center, and the fragrant common yarrow, which features clusters of small white flowers. The Slope also features a trail that leads to a rocky outcrop at the top of the hill and a rustic bench made by our three-person rustic crew. Look closely — mourning doves, monarch butterflies, hummingbirds, caterpillars, and other wildlife have been spotted here. Curious what it takes to establish a new native meadow? 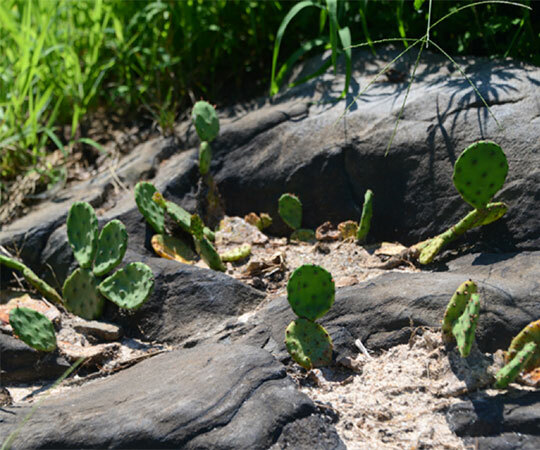 See our blog post on how the Conservancy transformed a weedy, eroded hillside into the Dene Slope. 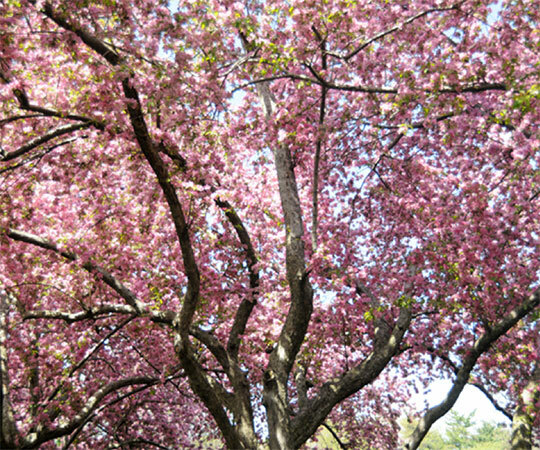 Take a closer look at the flowers of Central Park by visiting our official Bloom Guide. Wherever you find yourself admiring spring blooms in the Park, we hope you’ll share the vibrant colors with us by tagging @centralparknyc and using the hashtag #CentralParkBloomWatch.